Would you ever believe that a fish no bigger than your fingernail could provide information on the best form of therapy for cancer treatments? Well, it’s true! 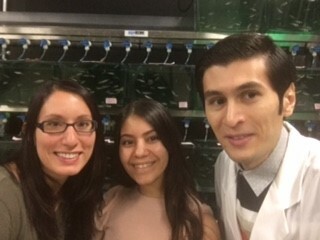 In the Porter lab, the zebrafish group is a part of the Breast Group with our focus being on using fish, specifically zebrafish, to answer questions about which form of therapy is best for individual breast cancer patients. We focus on how drugs work, the pathways inside the cells that they affect, and how the drugs get metabolized within cell culture and our zebrafish model. Zebrafish are a great model system to use to study heart diseases, neural development and neurotoxins, Alzheimer’s, muscular dystrophy, cancer, and much more! But, do fish have any similarities to humans to study human diseases? Interestingly, yes, they do! They are vertebrates, which are animals with backbones and they share more than 75% of the genome with humans. They have organs similar to humans and have a brain and spinal cord. With an internal environment similar to humans, their responses to cancerous cells and cancer treatments are true to how humans will respond. Zebrafish embryos and larvae are translucent, so we can track the cells throughout the zebrafish daily. We can watch tumours form and regress without any invasive procedures. What’s even greater about using these fish is they have an innate immune system when they are born, but their fully developed immune system doesn’t come into play until 2 weeks after they are born. What this means is we can inject human cells into the fish and they won’t get rejected, but unlike other animal models, the cells are still exposed to some immune system regulations. With all of this, we can now approach new biological questions that I’m so excited to share with you! Breast cancer isn’t just one disease. It varies with each patient, which is what makes it difficult to treat at times. We can simplistically separate it into two separate groups or subtypes; hormone receptor positive and triple negative. Each group is controlled by many different factors. Hormone Receptor Positive: Patients grouped into this subtype in the clinic means their cancer has at least one of three hormone receptors; estrogen, progesterone, and/or human epidermal growth factor 2 (Her2). A benefit of this subtype is these receptors can be targeted with specific drugs to stop the cells from dividing; however, 10-20% of the patient population can develop resistance to these targeted therapies over 10 years and relapse can still occur. A major question is how does resistance or relapse occur? While there are many possible roles, we were able to dissect one mechanism earlier this year. In February 2017, we published a paper in Oncotarget 2017; 8:23337-52 which described how our protein of interest, Spy1, regulates the estrogen receptor and its pathway changing its response to hormone therapy. As mentioned in previous posts, Spy1 is a protein that promotes increased cell division by binding to CDKs. I was able to show that when I expressed high amounts of Spy1 in breast cancer cells, the estrogen receptor stopped responding to the hormone therapy Tamoxifen. Using our zebrafish model, we were able to confirm this finding by injecting Spy1 elevated breast cancer cells into the zebrafish followed by treatment with Tamoxifen and watching little to no effect on the tumour. When I inhibited the Spy1-activated pathway (specifically inhibiting the kinase ERK1/2), this showed a significant response to Tamoxifen therapy. Knowing Spy1 levels in patients and targeting Spy1 activated pathways could help us understand what treatments will be more successful. Triple Negative Breast Cancer: Approximately 10-20% of breast cancers are found to be triple negative. Patients in this subtype do not have high levels or any presence of the estrogen, progesterone, or Her2 receptors. These cancers grow independently of these hormones. Without these receptors, targeted therapies are not useful. These patients are usually treated with chemotherapy. Response to chemotherapy is initially high; however, 34% of triple negative patients have a high recurrence rate in only 2.6 years. One of the reasons for this relapse is the mixed population of cells within the tumour. Therapies normally treat the tumour as one whole product with the hopes that all the cells stop dividing and eventually die. But, the mixed population of cells include a high percentage of special cells called breast cancer stem cells. Breast cancer stem cells have been found to evade treatment, making them a dangerous population of cells. Trying to find new treatment options for triple negative patients that increases overall survival and years of disease free status is one of the most important aspects that we are trying to tease apart. In collaboration with Windsor Regional Hospital, the Porter lab is a part of two ongoing clinical trials. Since Spy1 has been shown to be elevated in more aggressive and invasive breast cancers (BMC Cancer 2012 12:45), and since elevated levels in hormone positive breast cancers affects treatment, we are interested in determining whether high levels of Spy1 in triple negative patient samples can affect their response to chemotherapy regimens as well as new forms of treatment currently entering clinical trials. Our first clinical trial was to look at the levels of Spy1 in hormone positive and triple negative breast cancer. For this, I received patient tissue in paraffin blocks and created multiple tissue microarrays. These tissue microarrays are then stained for different proteins, which can create a signature for each patient. The goal of this trial is to retroactively look at the patient’s response and levels of Spy1 and see if there is a correlation. For our portion in the second clinical trial, we will receive fresh patient tissue from the hospital, bring it back to the lab and isolate the cells. 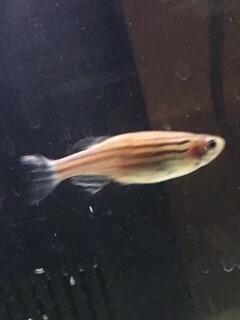 One of the first experiments we will perform will be injecting the cells into the zebrafish where we can test out the standard chemotherapy most triple negative patients receive in the clinic as well as some new treatments just entering clinical trials, such as synthetic CDK inhibitors. CDK inhibitors (CKIs) are naturally found in your body and regulate cell division. They stop your cells from dividing too much or too fast. In cancer, there is a decrease in the amount or levels of these inhibitors, meaning cells have less control in stopping cell divisions from occurring. Pharmaceutical companies have found a way to combat this problem by creating synthetic CKIs and re-introducing them to the body as a form of cancer therapy. 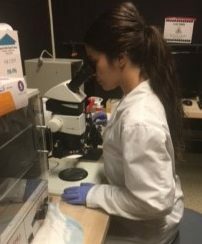 Annie, a very hardworking and dedicated 3rd year undergrad who has received the NSERC Undergraduate Student Research Award for the last 2 years, is currently testing out a number of these CKIs using cell culture work and our zebrafish model on triple negative cell lines. She has already begun to see exciting results and has started combining CKIs with other therapies to test their efficacy. Once patient samples are received from the hospital we can then utilize the protocols she has worked so hard to perfect and we can begin seeing results within one week of testing! Another aspect of our portion of the clinical trial is to determine what effect breast cancer stem cells may have on treatment. A masters student in the lab, Ellen, is working on multiple tools for our lab to use to determine how much of a population is made up of stem cells. Current work around the world use different kits with labelling techniques, but these have shown to be inconsistent. What Ellen is working on will allow for a more standardized and reliable way to detect stem cell populations. With this new detection method, we can sort out the stem cell population and find new ways to treat these cells to increase response rates in patients. 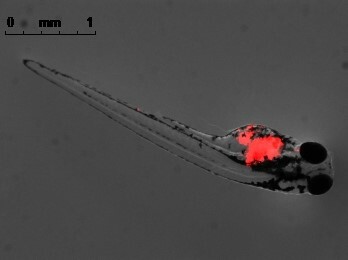 After testing this model in cell lines, we will be able to inject the newly sorted stem cells into the zebrafish model for further treatment testing. Did you ever wonder how cancer could start in one place, like the breast, and move to another area of the body? Well, cancer cells must go through multiple steps to migrate from one tissue to another and then invade that second tissue. 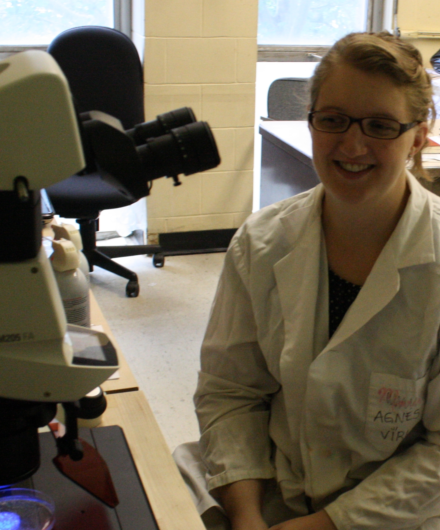 In our group, we have a PhD student, Janice, working on what signals are active in all those steps that makes a cell successfully migrate and invade new tissue. She is trying to figure out whether Spy1 increases the rate of migration and the chances of survival when cells reach the new tissue. She is doing a lot of work in cell culture testing out many different pathways to see which ones are driving these processes. She utilizes the zebrafish model to test out what she sees in cell culture, showing an increase in cell migration when Spy1 levels are increased. 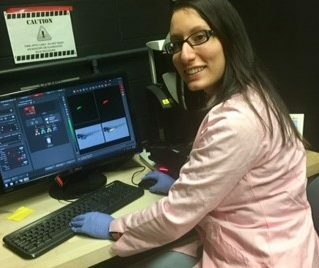 Janice has secured a Mitacs Accelerate Studentship through collaboration with Acenzia here in Windsor based on her work with the zebrafish model. 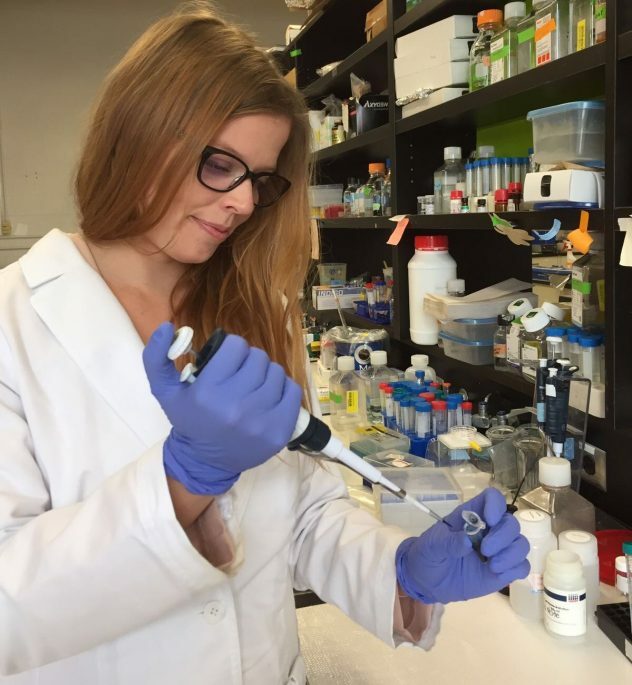 Using the zebrafish, she is testing out the toxic effects chemotherapy drugs can have on the zebrafish and looking at how therapies can alter the immune system. Understanding the immune system regulations and changes is important for understanding the responses we see in the clinic. Our breast group is always growing, with our newest PhD student Martin, coming to us in 2016 after receiving the Ontario Trillium Scholarship (OTS). Martin has just begun looking at a small subtype of triple negative breast cancer that have the androgen receptor and what role this receptor plays in other subtypes of breast cancers. The androgen receptor, like the others already mentioned, is a hormone receptor and is activated by androgens/testosterone. Martin’s interest in this specific subtype comes from his interest and background in studying Prostate Cancer. Prostate and breast cancer are not that different from each other. Hormonal regulation plays a major role in the development of both cancers and resistance to hormone therapy can happen in both. Prostate cancer is one of the most common cancers found in men; however, research, earlier detection methods, and better treatment options have significantly decreased the death rate by 3.3% per year since 2001. Martin has already completed an abundance of work studying the role Spy1 plays in prostate cancer and if there is any correlation between Spy1 and the androgen receptor. His work is focusing on the subtype of prostate cancer, called neuroendocrine transdifferentiation prostate cancer, which forms after treatment with anti-androgen deprivation therapy and loss of the androgen receptor. He is focusing on Spy1 in 3 main pathways; AKT, β-catenin, and CDK1 activation, to determine if other therapies can be used when androgen dependence is gone. 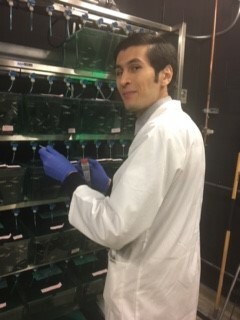 He is also focusing on the role Spy1 plays in the migration and invasion of prostate cells using our zebrafish model. In our cells and our zebrafish our main goal is to find new and better therapeutics for cancer patients. We understand that each patient is different and should be treated based on their specific cancer and genetics. Our Canadian Institute for Health Research (CIHR) funded work is trying to shed light on what role Spy1 plays in multiple pathways that could lead to patient resistance in breast cancer. We are developing new tools and using a new model system to help us get to answers faster and more reliably. Research can be enjoyable, but it can also be tough, so we try to follow Dory’s motto while we work and we “just keep swimming!” I hope you enjoyed learning about the second half of the Breast Group! Let us know what you think in the comments below! This entry was posted in In the spotlight and tagged Biology, Breast cancer, Cancer research, Cell Cycle, CIHR, Health, In the spotlight, Lisa Porter, Movember, NSERC, Ontario Trillium Scholarship, Porter Lab, Prostate Cancer, Research, Stem Cells, University of Windsor, Windsor Cancer Research, Zebrafish. Bookmark the permalink.